Domaine l’Abbe Dine is a new domaine in the Southern Rhone Valley. They are located in Courthezon. While the vineyards have been owned by the same family for close to 140 years, 2012 marks the debut vintage for the wines of Domaine l’Abbe. The Reynaud family began planting vines in Chateauneuf du Pape in the 1880’s in the Les Berdines lieu dit. The name, l’Abbe Dine can be translated into “The Abbot’s Dinner”. With the 2012 vintage, Nathalie Reynaud brought in Philippe Cambie to consult on the wines and vineyard management. Prior to the 2012 vintage, the harvest of Domaine l’Abbe Dine was sold to another Chateauneuf du Pape producer and family friend as well as Cellier des Princess, the local cooperative. Once their final contract expired in 2017, you are going to see more wine from Domaine l’Abbe Dine. Domaine l’Abbe Dine owns 4 hectares of vines in the Chateauneuf du Pape appellation that are planted for the production of red wine grapes. The estates uses only organic farming techniques. 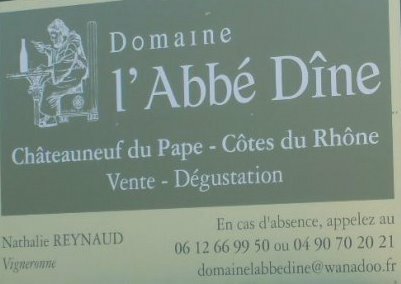 Domaine l’Abbe Dine produces 1 Chateauneuf du Pape Rouge wine. Domaine l’Abbe Dine Chateauneuf du Pape is made from a blend of 80%, old vine Grenache, 15% Syrah and 5% Mourvedre. Some of the vines used in this wine are more than 120 years of age! The vine are well placed in the Les Bedines vineyard. Vinification takes place in stainless steel tanks. The wine is aged in cement vats. Domaine l’Abbe Dine can be enjoyed on the young side. Young vintages can be popped and poured, or decanted for about 1 hour, give or take. This allows the wine to soften and open its perfume. Older vintages might need very little decanting, just enough to remove the sediment. Domaine l’Abbe Dine is usually better with 2-4 years of bottle age. Of course that can vary slightly, depending on the vintage. In the best vintages the wine should be consumed within 3-12 years after the vintage. Domaine l’Abbe Dine is best served at 15.5 degrees Celsius, 60 degrees Fahrenheit. The cool, almost cellar temperature gives the wine more freshness and lift. Domaine l’Abbe Dine is best served with all types of classic meat dishes, veal, pork, beef, lamb, duck, game, roast chicken, roasted, braised, stewed dishes, sausage, barbecue, grilled meats and cassoulet. Domaine l’Abbe Dine is also good with Asian dishes, hearty fish courses like tuna, mushrooms, cheeese pasta, eggplant and tomatoes. Dark, black cherries, licorice, spice and pepper notes shine quickly here. The wine is round, soft, forward and while it can age, it should also offer pleasure early, due to the all the ripe, sweet fruits and soft tannins. The wine was made from 100% old vine Grenache. Elegantly textured, pure cherries and garrigue with a soft, refined, medium bodied, character that you can enjoy young or age a few years. The wine was made from 90% Grenache, 8% Mourvedre and 2% Syrah. Medium bodied, fresh and with ample, sweet, red cherry and wild strawberry to get things started. The wine is soft, polished and peppery, with just the right garrigue accent to hit the spot. Garrigue, spice, black cherry and incense on the nose moves you to a wine with sweet, red fruits, elegant, soft textures and an already open, peppery finish. Spicy, peppery and filled with ripe red fruits, the soft, forward wine ends with a cherry griotte finish.